Illustration by Jim Cooke. Photo via Shutterstock. A child is born with no state of mind. Innocent to the ways of the world. What sort of world will you be presenting to your child when they open their eyes for the first time? Will it be a world of almond milk? It does appear so. Quite. Yes, quite so. Every so often there are tectonic shifts in our culture that are only later perceived—that are too subtle for those in the contemporary world to discern. Who, for example, would have imagined that the introduction of aerosol hairspray would destroy our ozone layer? Who would have guessed that the young man shooting “sky hooks” on the shores of Mauna Loa would one day become Barack Hussein Obama? Few, if any. A cultural shift of similar import is upon us. Like most pivotal moments in history, this one will be scoffed at by the masses, its gravity appreciated only by later generations of historians and intellectuals. Come with me now on a journey—a journey to the heart of understanding “what’s happening” in our society today and in potentially millions of days to come. First, some historical background: after the evolution of the cow, man invented milk. Countless generations of mothers raised their children on milk from cows, perhaps inspired by the similar, but less popular, milky substance produced by female humans. Now, fast forward to modern times. We live in an age of breathtaking connectivity and the answer to all of the world’s questions available at the tip of your fingers (where your smart phone is). One of the world’s questions has long been: “Are cows happy?” No, they’re not, because we take all their milk!! Predictably, the very children who we feed the milk to are the ones who start getting sassy about how sad cows are once they become old enough to grasp the nuances of philosophy. The answer? Enlightened parents feed their kids almond milk instead. Almond milk is good. It doesn’t involve any cows. And it has a nice creamy flavor that works well in coffee and on cereal alike. Try it with a cookie, and I think you’ll agree—mmmm! So what accounts for the persistence of regular milk? Well the biggest thing is when you go to buy almond milk most kinds have only been available in half gallon sizes, which are too small to fill the needs of a busy family until the next trip to the grocery store. Now, I just noticed recently, you can buy a whole gallon of almond milk at the store. A big plastic jug with the handle. (Technically it is “96 ounces,” which scientists generally agree is close to the size of a gallon.) This means that hardworking families can now affordably purchase almond milk as the family’s #1 milk source on a regular basis, without being forced to go back to the store all the time after the kids drank all the milk. That jug is gonna last you. I expect that we will now see an entire generation of children being raised on almond milk alone, leading to happier cows and more almondy people. 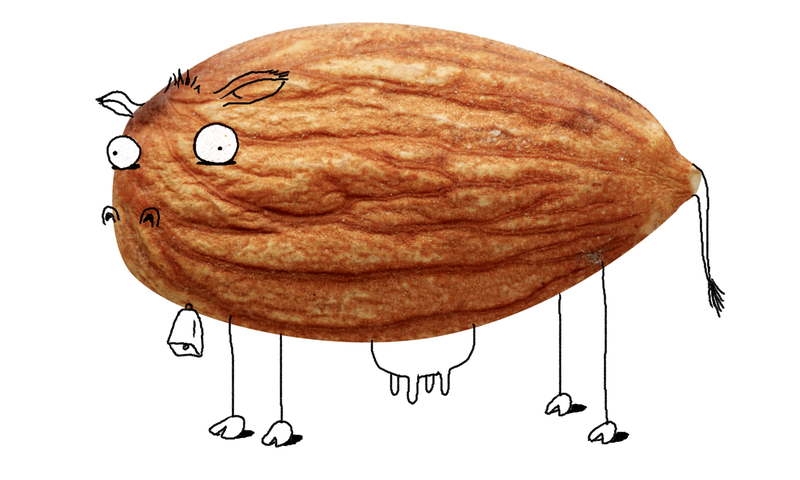 We may in fact live to see a future in which children would no more contemplate sucking milk out of the engorged teat of a cow than they would consider not sucking (almond) milk out of the engorged teat (container opening) of a gallon-sized almond milk jug. As our dairy choices change, so too will our popular culture, our nutrition, our ethics, and perhaps our politics. It is indeed too early to say what the future may hold. No one can predict what will happen ten, twenty, thirty, or even thirty-seven years from now. Nor can we predict what will happen thirty-nine years from now. But with careful scrutiny to cultural trends such as this, we can predict that one day in the future, you will be able to say, “I was there”—in reference to the historical period when America’s taste for almond milk was enabled to go mainstream thanks to the availability of almond milk in full gallon sizes. The rest is up to you. The time that you would have spent going to to store to pick up another half-gallon of almond milk you can now spend bettering yourself, at last.